In business, sometimes less brings more. Focus on one killer product and see how it means more value for your customers and more profit for you. Offer a one-killer product. [Click To Tweet]. Learn from this successful case study. [Click To Tweet]. Reduce confusion in your business. [Click To Tweet]. 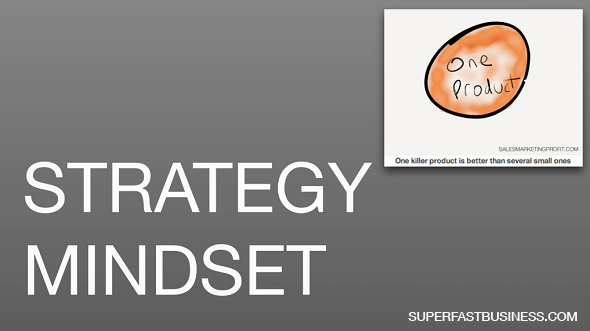 So the next topic is strategy and mindset. I want to dig deeper into a topic that was discussed on Sales Marketing Profit recently, and that was the move to one product. The idea that one killer product is better than several small ones. And the podcast is on SalesMarketingProfit.com if you haven’t listened to it. What we’re going to do later in this particular training session is we’re going to go behind the scenes and I’m going to show you how I crafted the case study and delivered it on the podcast, which was very popular. And it’s going to tie in a few themes today. I think you’ve attended a great session because the one product episode was a case study and the whole concept is that if you’ve got a lot of little stuff that you will bundle it all up and put it into one place. As a member of SuperFastBusiness.com, you are accessing all of my products that in many cases were individual products way back with FastWebFormula 1 and 2, they were sold as physical DVDs. The FastWebFormula 3 product was sold as digital recordings only, and FastWebFormula 4, the same thing, and then SuperFastBusiness Live 9, which was sort of FWF5, is available inside SuperFastBusiness membership. I could have sold some of those as individual products. You’ve also got Traffic Grab and Wealthification and Affiliate Pounce and SuperFastConversions, SuperFast Affiliates, SuperFast PPC; all of those courses were sold as individual courses and I’ve just gathered them all up, put them into one membership, had one monthly fee, and that’s it. And we have told over a thousand memberships for this particular format. And to give you some context, prior to having the SuperFastBusiness membership, it was called FastWebFormula. FastWebFormula was the first all-in-one situation that I had. Prior to that I had SuperFast Results for about 4 years, and I ran that concurrently as having all the individual products. And if you look at the original versions of OwnTheRacecourse training, we had several satellite sites where we were syndicating blog posts and we were running at least a dozen front-end websites. So that’s like 12 to 15 sales sites. That meant 12 websites to update, and to do plugins, and to update themes, and to check the traffic and the analytics, and it was literally time and focus to promote all those individual products and it was too complex. People actually didn’t even know what I had to sell. It was confusing to the buyers, it was confusing for the team, and there was a lot of time-switch moving between products and websites. We needed more staff to run it, I needed more time on marketing. Basically, if you add all the sales up, I was actually allowing people to only buy a little solution that was only going to help them a little bit compared to what they could get if they got access to the entire solution. The monthly training that we ran in SuperFast Results were kind of like little mini products. It was a first taste of what was possible, but now we’ve got one place. We’ve got one place to focus all this time and energy on. And that’s why we get such a great result from. So it’s a very powerful thing and the action step for you is to think about how many products and services are you offering and how could you package them differently. And there is actually some action steps for that and I will go through that with you by way of demonstration in the section later on where we talk about product creation. I’m actually going to go through the worksheet so you’ll end up getting this plus a format you can use to capture all this information.